Similiar to British cuisine, German cuisine has got a bit of a bad reputation especially in Europe but there are some real traditional gems and really their cuisine is just as good and diverse as the rest of the continant. 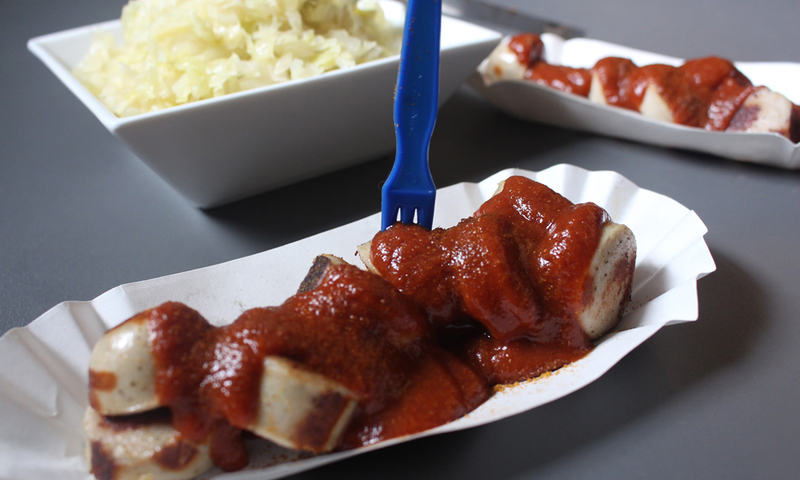 One of my favourites and one that brings back memories of Hamburg is the Currywurst. A few weeks ago my mum and sister went to Germany but because they were only taking hand luggage they couldn’t bring back the currywurst sauce (no liquids in the cabin you see), so I decided to have a go making my own. With the currywurst I usually serve it with sauerkraut (which takes about a week to make) and or french fries. I could tell you how to make the sauerkraut but to be honest I would be re-hashing the source I used so to make it watch this great video by Craig’s Kitchen. Remember it takes a week to make. Cook the bratwurst according to packet interactions, I like to do them on a griddle hotplate so I can gradually turn them using the griddle troughs to hold the sausage. Once cooked keep them warm in tin foil until you make the sauce. To make the curry ketchup sauce add the tomato ketchup, curry powder and garlic powder to a pan and slowly bring to a medium/hot temperature while constantly stirring. Add a little water to get the sauce to a pouring consistency and taste. If you want to it hotter you can add a little tabasco sauce. Slice the sausages up into centimetre pieces and plate up. Pour over the curry sauce and sprinkle with a little more curry powder. Serve with the sauerkraut or french fries.